Handb. Cacteenk. [Förster] 357, 1846. Origin and Habitat: Mexico (States of Tamaulipas, Chiapas, Hidalgo, Querétaro, San Luis Potosí, and Veracruz), south to Guatemala and Honduras. Altitude: 0 to 1000 metres above sea level. 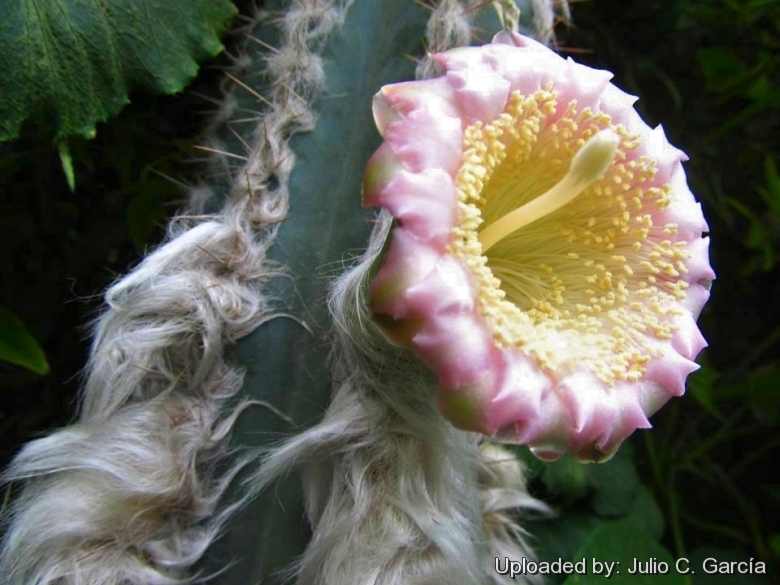 Habitat and Ecology: Pilosocereus leucocephalus inhabits tropical deciduous forest, xerophyllous scrub, and submontane forest. It germinates in the shade of plant canopies and in soil-filled rock crevices than in flat open areas. It is mainly bat-pollinated (bats account for 33-65% of fruit set); although to a lesser degree, diurnal visitors also caused some fruit set (7-15%). Diurnal visitors were more effective in populations containing honeybee hives. P. leucocephalus is partially self-compatible (14-18% of fructification) but unable to set fruit without visitors. It is widespread and common but threatened by localized small-scale deforestation for cattle and agriculture. 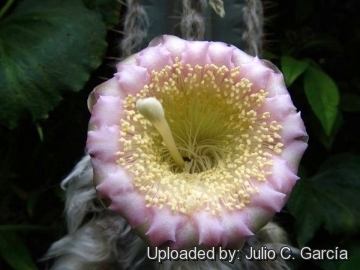 Description: Pilosocereus leucocephalus, more often labelled Pilosocereus palmeri, is a tree-like cactus whose branches are clothed in thick silky wool. Near the tops emerge short, funnel-shaped, flesh-coloured flowers. 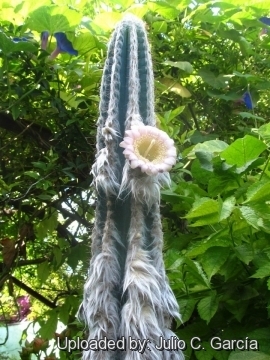 Pilosocereus leucocephalus is a variable species with a large distribution area. This accounts for the numerous synonyms. Habitat: It is a columnar cactus becoming a tree 2-6 m tall, more or less branched from below with well-defined short trunks. Stems: Erect or ascending, 5-10 cm in diameter. dark greener glaucous and light waxy blue at first. Ribs: 7-9 broad or with shallow sinuses. Areoles: 1-1.5cm apart, the upper densely clothed with white hairs 2-6 cm long. Spines: Brownish or yellow at first, becoming grey with age. Flowers: Tubular to bell shaped, whitish to light pink inside, reddish green outside, 6-8 cm long. Outer segments purplish brown, inner segments pinkish. There is a large globule of nectar in the base of the flower. Fruits: Spherical up to 4 cm in diameter, red, with red pulp and black seeds. They develop in a few weeks. 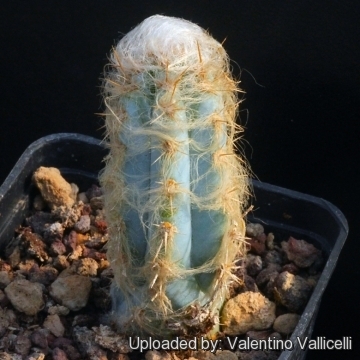 Cultivation and Propagation: Pilosocereus leucocephalus grows well and is a very vigorous growers (one of the quickest growing cactus), and is possible to increase the speed of growth to some extent by providing adequate amount of water, warmth, and an all-purpose liquid fertilizer diluted half strength during the active growing season, but it’s susceptible to rotting if too wet. It likes a sunny position also blasting sun in summer. 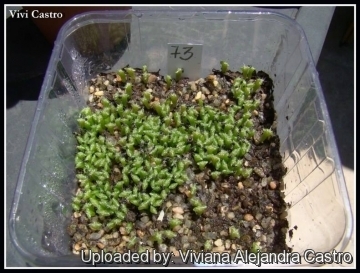 If grown indoor provide 4 to 6 hours, or more, direct morning or afternoon sun. It should be watered regularly in Summer and kept drier in Winter. It like pots with generous drain holes, need a very porous, slightly acidic potting medium (add pumice, vulcanite, and perlite). It can be grown outdoors in frost-free climates, needs anyway to kept above 12 °C and dry in winter. But it can tolerate temperatures down to 5° C (or even 0° C) for very short periods if very dry and ventilated.